Queen of Shadows. Queen of motherfucking Shadows. There is literally nothing in the world that I could say that could even remotely do the thing justice. I have no words. To say that this book is a turning point in the series would be an understatement. This is where everything in the Throne of Glass Series changes. All bets are off. Characters are transformed. New terrors are revealed. Ships are sunk and new ships are built in their wake. This book is just more of everything. More intense. More violent. More addictive. More terrifying. More swoony. More gut-wrenching. More epic. More.More.More. Strap yourselves in people, you're in for one hell of a ride! Queen of Shadows picks up right on the heels of Heir of Fire, which ended with all of our beloved characters being transformed, in one way or another. I suppose that it was only natural that, after all of the ordeals they'd been through, all of the trials they suffered and all of the trauma they endured to expect it all to have had a profound effect on everyone involved. But I think it's fair to say that none of us were ready for how much everything had actually changed. I'll admit that it was jarring at first, even for me, to witness how roles had been flipped on their heads, friendships thrown out of whack, ships crumbling and new ships taking shape slowly amidst the wreckage. I was scared, yes, but I also have a ridiculous amount of faith in Miss Sarah J. Maas, so I tried to let go of my worries and enjoy the ride...and before I knew it, I didn't need to try anymore. Sure, I mourned some things that were lost in the fire, but at the same time, I grew excited for what rose from the ashes. In terms of plot, Queen of Shadows hits the ground running and doesn't let up for a second. 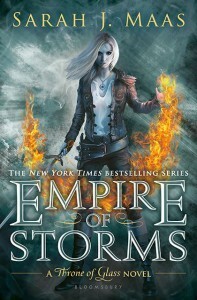 Things have always been dark in the Throne of Glass Series, but this installment definitely steps it up a notch. Or ten notches. New terrors emerged that chilled me to the bone. Seriously guys. Maas has taken her world to a whole.other.level. Her writing style has matured and she's grown bolder and fearless with her story, her characters. She's not afraid of taking risks and it was exhilarating to behold. I was enthralled from start to finish, and considering how many surprises blew me away here, I can safely say that I have no idea what to expect for the rest of the series, other than more EPICness, more horrors and more feels. SO MANY MORE FEELS. The bottom line? While I know this was a polarizing chapter in the Throne of Glass Series for many of you, for me, Queen of Shadows was just as addictive, compelling and satisfying as anything I've come to expect from Sarah J. Maas. This book consumed me, heart and soul and spit me out on the other side, a ragged, harrowed lump of feels who now has no idea what to do with herself. Just another version of how I've felt at the end of EVERY DAMN BOOK IN THE SERIES. Is it too soon to start begging/pining/counting down for Throne of Glass #5? !